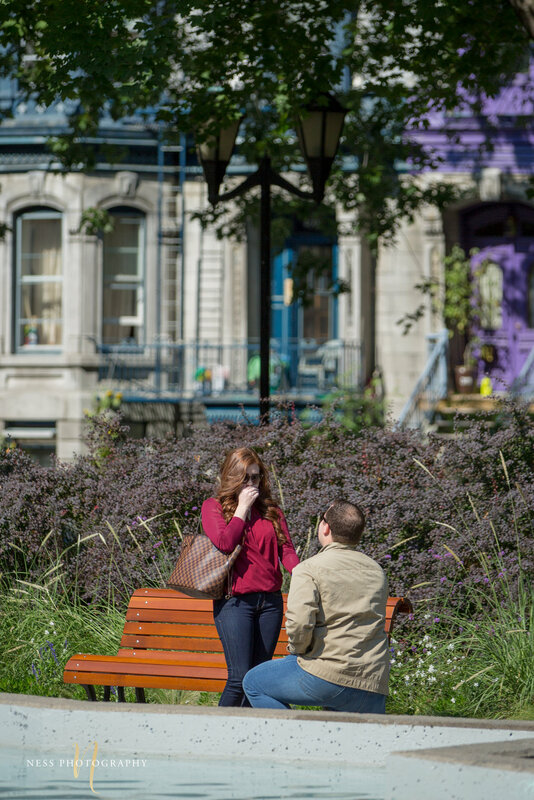 When Johnson planned his trip with Kelly from Florida to Montreal, he also planned a surprise proposal not to forget. 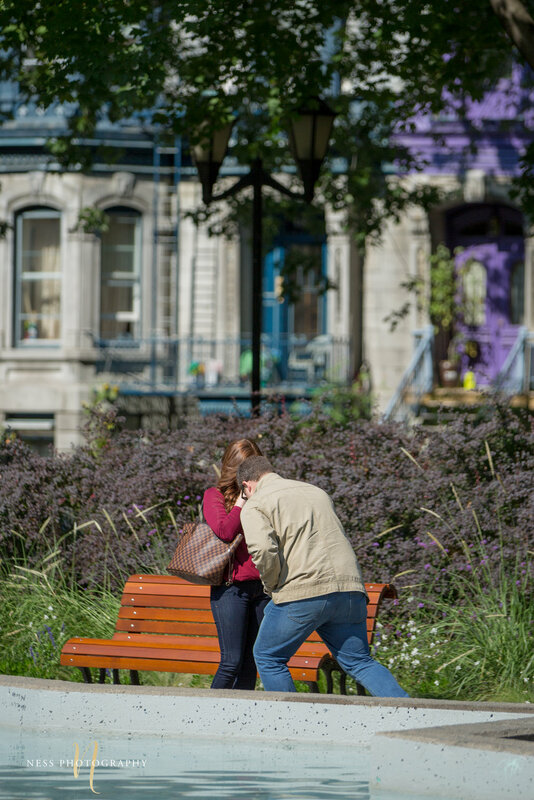 He researched all the popular places in Montreal and decided on Square Saint Louis in the heart of the plateau to pop the big questions. Johnson emailed me when he was still in Florida and we worked all the plan long distance. 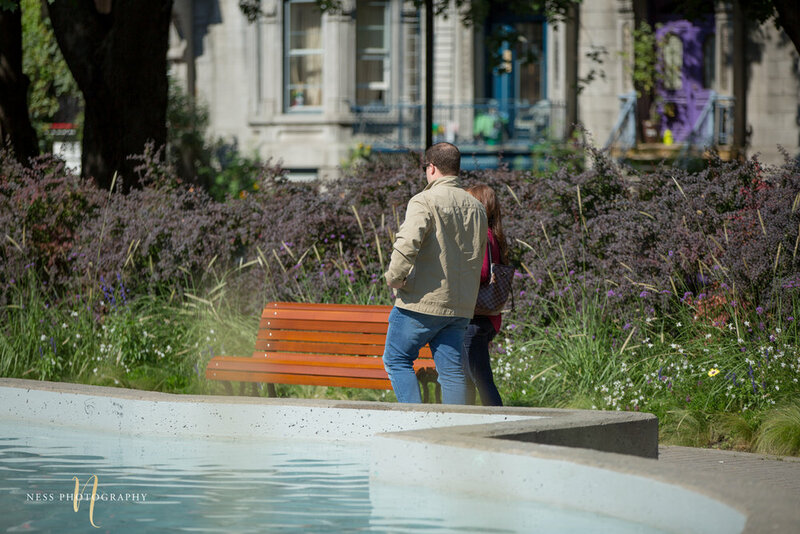 He would take Kelly out of the hotel to go for brunch at Mamis Calfoutis on rue Saint Denis but in the last minute he would walk through Square Saint Louis park where I would be hiding and waiting to capture the moment he proposes to her. One week before the proposal , I visited the location at the time the shoot would happen the week after to scout the best spot and find the best light . I also sent some photos to Johnson so he knows the spot where I would be hiding and where he should stand. When the big day came, we kept texting each other in the morning to confirm the time and the street intersection he would be coming from . I found a bush to hide behind and the waiting began. 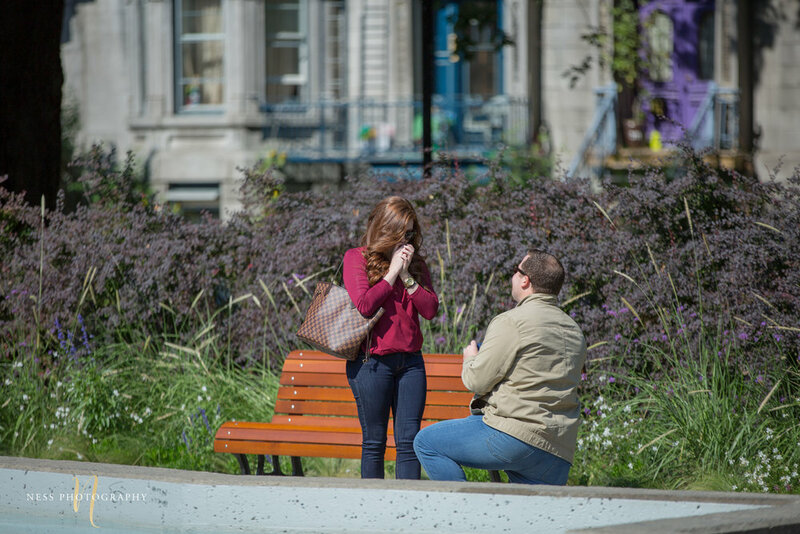 Every time I shoot a proposal , this would be the most intense moment where I am horrified of missing the moment or having someone block my view but thanks to close coordination and Johnson's extreme attention to detail, everything went smoothly and Kelly was totally surprised by the proposal. In addition to Kelly's surprise when she saw the ring, she also got a second surprise (or should I rather say get scared ?!) seeing a photographer approaching her with a huge zoom lens 2 minutes after she got proposed to.